After Two Of The Greatest Bull Markets In US History, Why Are Boomers So Broke? This goes back to Wall Street’s suggestion of “buy and holding” investments because over 10- and 20-year holding periods, investors always win. There are two major problems with this myth. First, on an inflation-adjusted, total return basis, long-term holding periods regularly produce near zero or negative return periods. Secondly, given that most individuals don’t start seriously saving for retirement until later on in life (as our earlier years are consumed with getting married, buying a house, raising kids, etc.,) a 10- or 20-year period of near zero or negative returns can devastate retirement planning goals. It should be obvious, when looking at the two charts above, that WHEN you start in investment journey, relative to current valuation levels, is the most critical determinant of your outcome. Let’s look at this differently for a moment. The financial media and blogosphere is littered with advice on how easy it is to invest. As noted above, over long-periods of time there is absolutely nothing to worry about, right? Okay, let’s assume that is true. The “Baby Boom” generation are those individuals born between the years of 1946 and 1964. This means that this group of individuals entered the work force between 1966 and 1984. If we assume a bit of time from obtaining employment and starting the saving and investing process, most should have entered the markets starting roughly in 1980. Despite those two little minor percentage drawdowns, baby boomers have been fortunate to participate in two massive bull markets over the last 38-years. 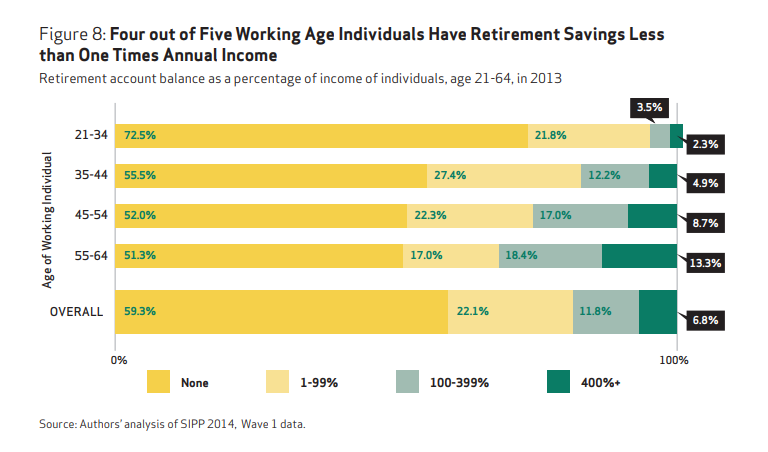 So, given this steadily rising trend of the market, most individuals should be well prepared for retirement, right? The why isn’t that case. Let’s take a look at some of the myths and facts. 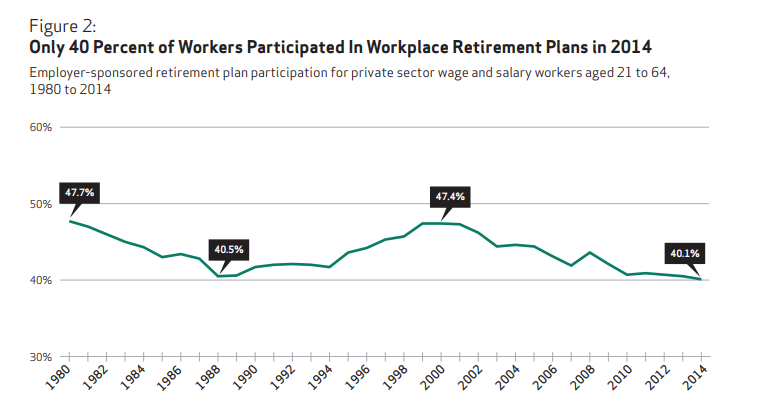 Myth: Everyone contributes to a retirement plan. 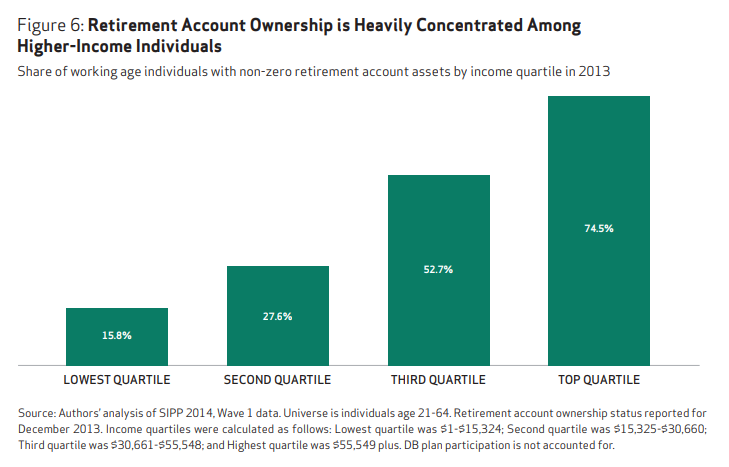 According to a recent NIRS study only 51% of Americans have access to a 401k plan. More importantly, only 40% of individuals actually contribute to one. Here is another way to look at it. 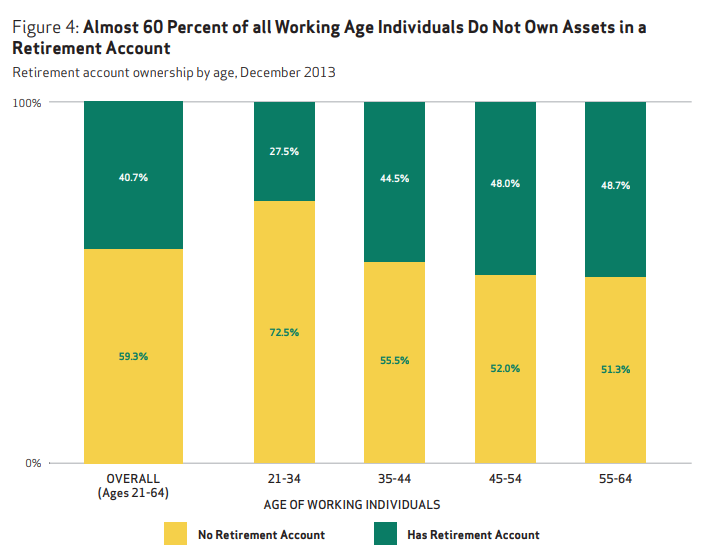 Almost 60% of ALL WORKING AGE individuals DO NOT own assets in a retirement account. 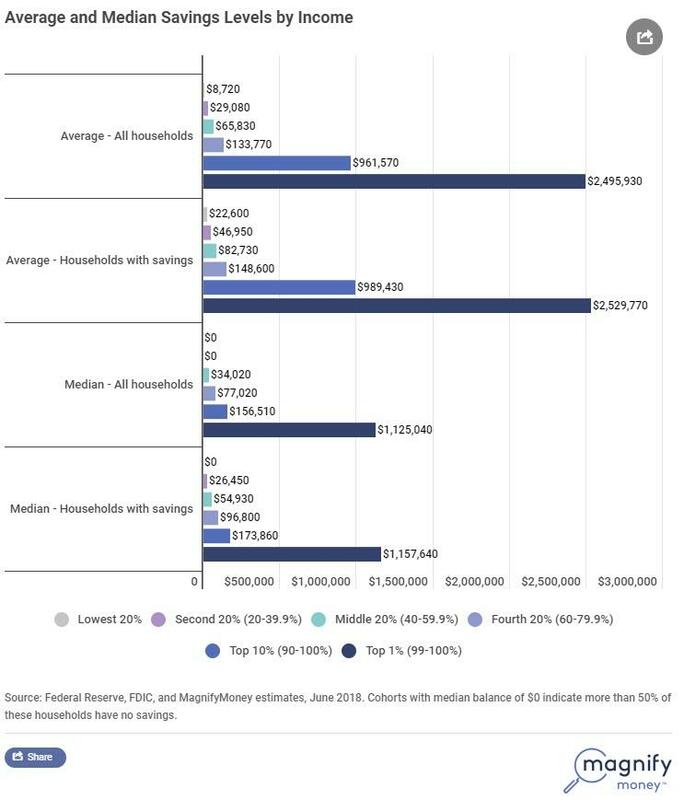 And of those that do own retirement accounts the majority are of the wealth, unsurprisingly is owned by those with the highest incomes. It’s actually worse than that. Myth: Individuals save money in lot’s of other ways. If investing is as easy as the financial media and advisors portray it to be, then why is the vast majority of American literally broke? Go back up to that S&P 500 cumulative percentage gain and loss chart above. That is the most deceiving chart ever made to convince individuals to plunk their money down in the market and leave it. Using percentages to dispel the impact of losses during bear market declines false into the “statistics” category. If the market rises from 1000 to 2000, it is up 100%. However, if it then falls by 50%, you don’t lose just 50% of what you gained. You lose 50% of everything. If we revise the chart of the real, total-return, S&P 500 chart above to display the cumulative gains and losses in points, rather than percentages, the reality of damages from bear markets is revealed. You will notice that in every case, the entirety of the previous bull market advance was almost entirely wiped out by the subsequent decline. Age 30’s: In 1980 the “baby boomer” generation is working, saving, and participating during one the 80-90’s bull market. Age 50’s: From 2000 to 2002, the “Dot.Com” crash cuts their savings by 50%. Age 53-57: From 2003-2007 the full market grows savings back to their previous level in 2000. Age 57-58: The 2008 “Financial Crisis” wipes out 100% of the gains of the previous bull market and resets savings values back to 1995 levels. Age 58-63: From 2009-2013 financial markets rise growing savings back to the same levels in 2000. At the age of 63, “baby boomers” are staring retirement in the face. Yet, because of the devastation of two major bear markets they are no closer to their retirement goals than they were 13-years earlier. 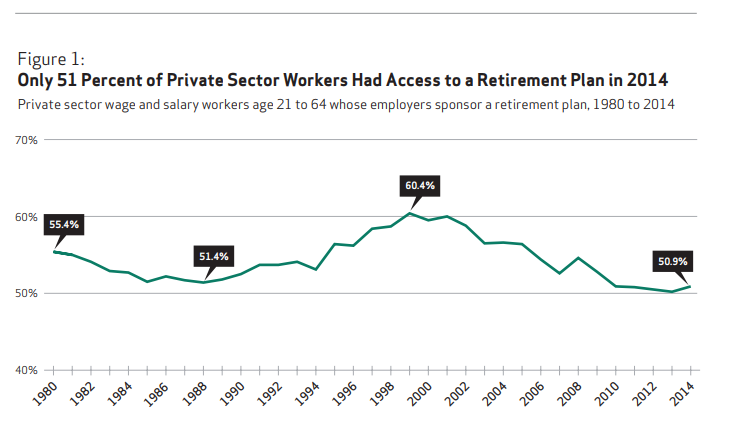 This problem is clearly shown in the retirement statistics above. But it is actually worse than that. From 2008 to present, the S&P 500 has more than tripled in value. 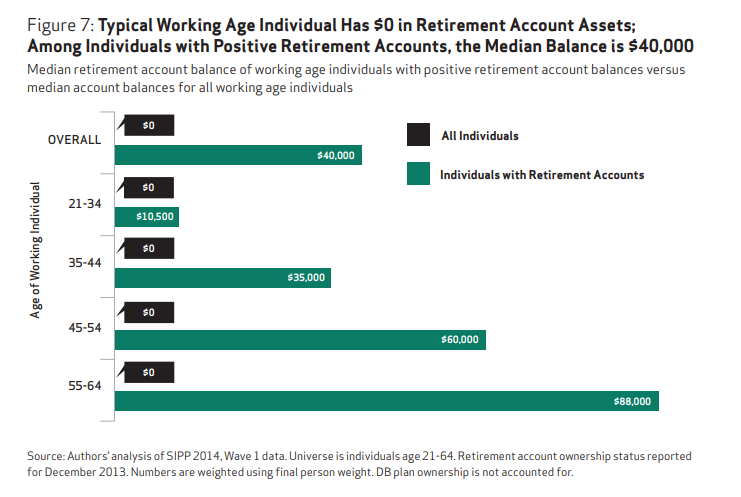 Yet, as shown by the table from Fidelity investments below which is a great sample size for most Americans, 401k accounts and IRA’s barely even doubled. 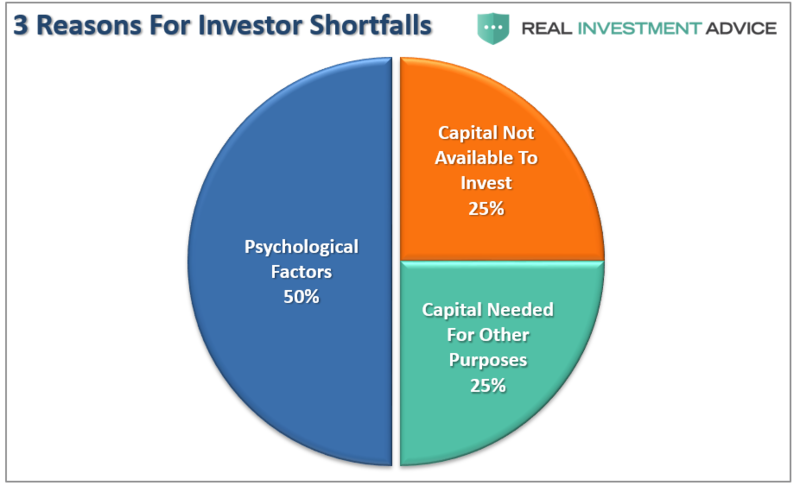 These biases come in all shapes, forms, and varieties from herding, to loss aversion, to recency bias and are the biggest contributors to investing mistakes over time. The problem that is unfolding for investors going forward is that while the mainstream financial press continues to extol the virtues of investing in the financial markets for the “long-term”, the assumptions are based on historical data which is not likely to repeat itself in the future. 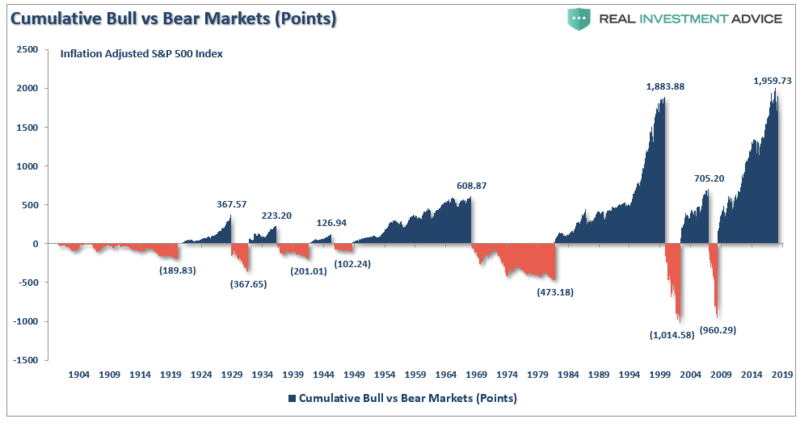 Jeff Saut, Liz Ann Sonders, and others have continued to prognosticate the financial markets have entered into the next great “secular” bull market. As explained previously, this is not likely to the be case based upon valuations, debt, and demographic headwinds which currently face the economy. “You must have some kind of strategy for dealing with market volatility. He’s right. Combine high levels of debt, with high valuations, and psychological impediments and the outlook for investors isn’t great. Does this mean you should NOT invest at all when valuations are high? No. What it means is that you have to CHANGE the way you invest. Conversely, when valuations are high, you have to shift your thinking more to capital preservation and being more opportunistic on how you invest. Controlling risk, reducing emotional investment mistakes and limiting the destruction of investment capital will likely be the real formula for investment success in the decade ahead. With this in mind, individuals need to carefully consider the factors that will affect their future outcomes. Expectations for future returns and withdrawal rates should be downwardly adjusted. The potential for front-loaded returns going forward is unlikely. The impact of taxation must be considered in the planned withdrawal rate. Future inflation expectations must be carefully considered. Drawdowns from portfolios during declining market environments accelerate the principal bleed. Plans should be made during rising market years to harbor capital for reduced portfolio withdrawals during adverse market conditions. The yield chase over the last 8-years, and low interest rate environment, has created an extremely risky environment for retirement income planning. Caution is advised. Expectations for compounded annual rates of returns should be dismissed in lieu of plans for variable rates of future returns. Chasing an arbitrary index that is 100% invested in the equity market requires you to take on far more risk that you likely want. 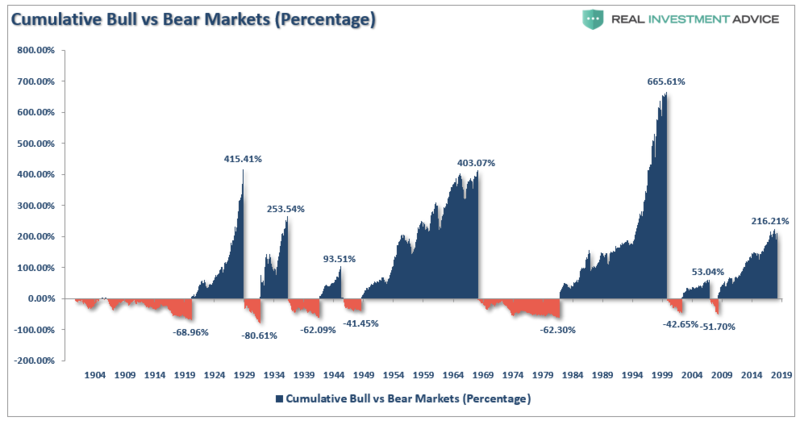 Two massive bear markets over the last decade have left many individuals further away from retirement than they ever imagined. Furthermore, all investors lost something far more valuable than money – the TIME that was needed to reach their retirement goals. Yes, you can do better. You just have to turn off the media to do so. There should be no one more concerned about YOUR money than you, and if you aren’t taking an active interest in your money – why should anyone else?